Fall in the Rocky Mountains. And what better place to view the changing colors than from the heights of the Marriott Tech Center tower, while listening to music, of course. This year’s show was in the freshly remodeled venue which even featured a brand-spanking-new Starbucks! And CANJAM returned to being held in a nice big ballroom instead of a tent, which was great, except cell signals were much more robust in the old tent. In the ballroom, I could not even stream Tidal. 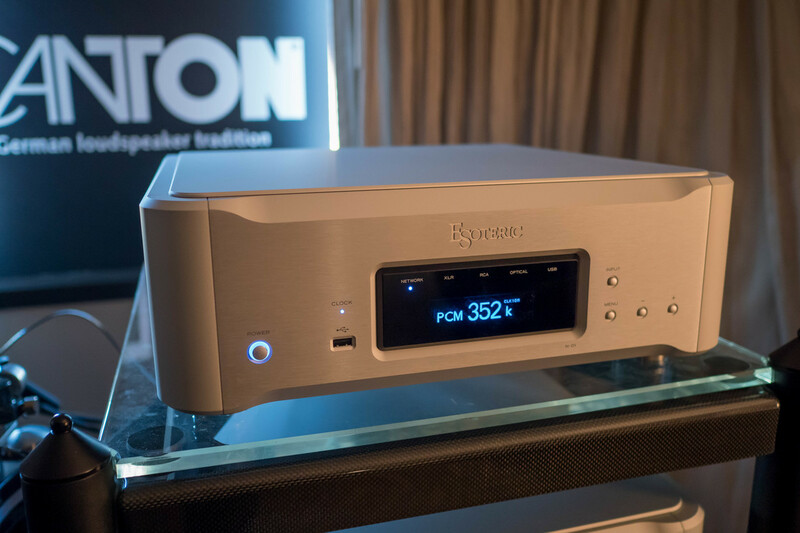 Esoteric introduced its new flagship network audio player, the N-01 ($20,000), which includes a premium DAC module that is identical to the one used in Esoteric’s Grandioso K1 super audio CD player. The N-01 utilizes the AK4497 chip set and employs an 8-circuit independent power regulator for each channel. It can play any digital file to 384/32 PCM and 5.6MHz DSD in all major formats. The N-01 supports streaming services including Tidal, Roon, Spotify, and Qobuz. The N-01 is also MQA-compliant and can accept a signal from an external master clock. Given all that it does it’s not all that surprising that it weighs slightly more than 56 lbs. The new Focal Clear ($1500) is positioned in the French company's lineup between the Utopia ($3999) and the Elear ($999). According to Focal, the Clear design “surpasses Elear in terms of openness…” The Clear differs from Focal’s other two headphones in its new copper unsupported coil and aluminum/magnesium alloy "M" profile speaker dome. Like the Utopia and Elear, the Clear is 104dB/1mW, but unlike the Utopia and Elear whose accessories are Spartan, the Clear delivers a complete package, including a slick portable case as well as both balanced and unbalanced cable options. The Clear is also slightly easier to drive with only 55-ohm impedance versus the Utopia and Elear’s 80 ohms. It’s been several years since Audio-Technica unveiled a new flagship headphone. 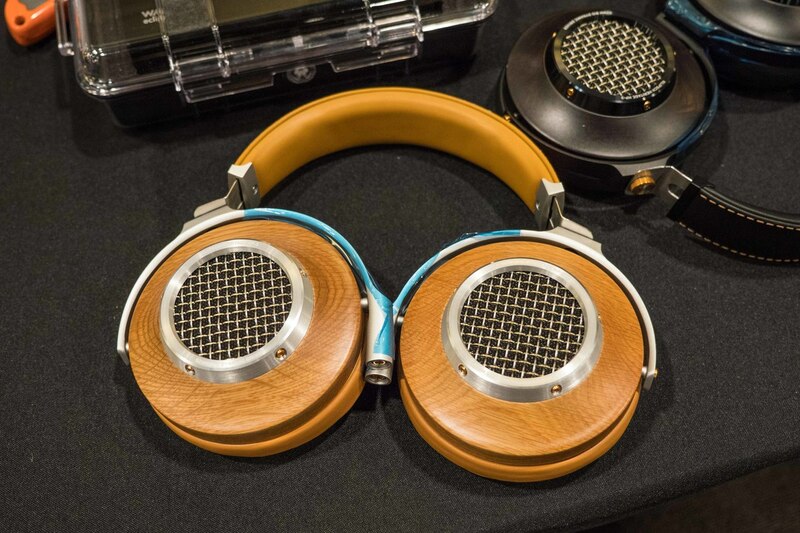 At RMAF I witnessed the North American premiere of the Audio-Technica ATH-ADX5000 ($1999). This is an open-air design that utilizes AT’s new core mount technology CMT, and new integrated driver unit which features a large, 58mm, tungsten-coated diaphragm. 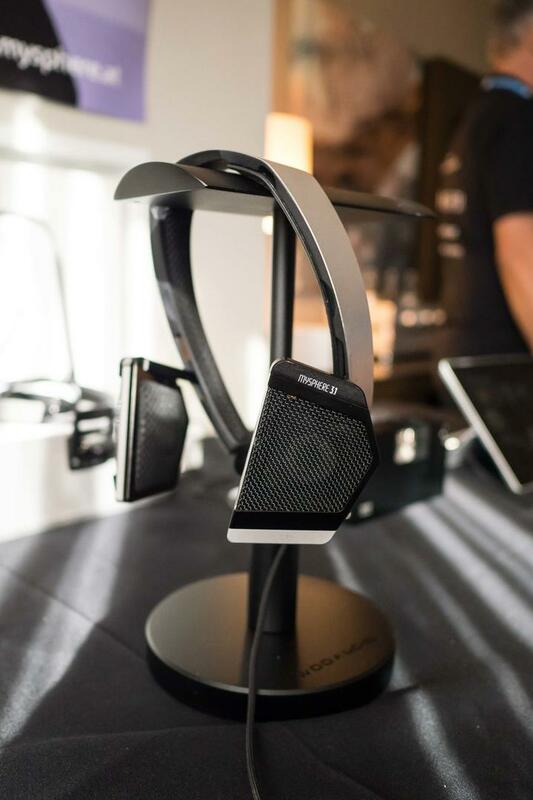 The ATH-ADX5000 uses a lightweight magnesium frame and a different headband (without the wings that AT uses on many of its other headphones). I found the ATH-ADX5000 headphone was far better fit for my head due to the new sans-wings headband. Sonically, the ATH-ADX5000 are so open, with no isolation from outside sounds, so listening at CANJAM was less than ideal. I’m looking forward to trying out a review sample in the quiet of my own listening space sometime later in the year. The Abyss AB-166 has impressed me every time I’ve heard it, but I found the fit not to my liking: Whenever I moved my head they would come tumbling off. The new Abyss Diana ($3000) offers the same technology in a more head-friendly package. 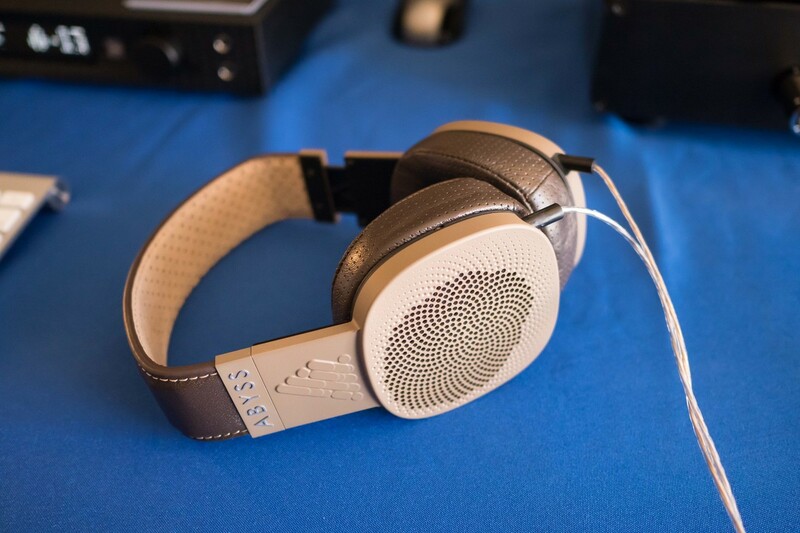 Abyss calls the Diana the “thinnest boutique headphone in the world.” I found the fit was comfortable and the sound was almost as marvelous as from the original model. Made using “aircraft-grade aluminum” and available in three colors—onyx, arctic white, or coffee—the Diana frees the Abyss technology from the discipline of sitting rigidly upright, chained to a desktop. With a sensitivity of 91dB/1mW and 40 ohms impedance the Diana will also be easier to drive than its forbearer. Stax had its new flagship headphone amplifier on active display, the SRM-T8000 ($6000), tethered to an SR-009 earspeaker. The new amp features two 6922 tubes in its hybrid circuit and has provisions for four different input sources. The SRM-T8000 supports two high-voltage Stax earspeaker connections as well as something I’ve never seen before on a Stax headphone amplifier—a level control bypass. Like the classic Stax headphone amplifiers of the past the large centrally-located volume control has separate rings for the right and left channel to allow for minute channel balance adjustments that don’t change as you increase or decrease the volume. I listened to the amplifier for about five minutes and had to tear myself away to go to the next room at the show. Acoustic Research, known affectionately as AR, has gone through several corporate owners over the years, but the company's current owner, VOXX, seems determined to set AR on a high-performance path with an impressive array of new portable products, including players, headphones, and in-ear monitors. I received a review sample of the new AR-H1 planar-magnetic headphone ($599) a few weeks before the show. It’s an open design with little isolation from outside noise. Fortunately, I could listen to it at home prior to the show, where the environment was far quieter than at CANJAM, so I can confidently attest to the H1’s sonic quality. Final earphones, who hail from Japan, had a great display location near the food trucks, in a common area suffused with sunlight. The company had its latest flagship, the D8000 (Price still TBD) on display. It employs Final’s proprietary Air Film Damping System (AFDS). The design uses the pressure of air, moved by the diaphragm itself, to damp the diaphragm’s movement. It does this by way of a metal disk with holes which impede the movement of air on either side of the driver. I was impressed with the D8000’s comfort and wide-open sound. I always loved the harmonically rich balance of the original Audeze LCD-2, which was released in 2009, but its weight and excessive side-pressure meant that I could only enjoy it fully for short periods of time. The new Audeze LCD-2C ($599) is not only quite a bit less expensive than the original, but also lighter, with a new carbon-fiber suspension headband design. 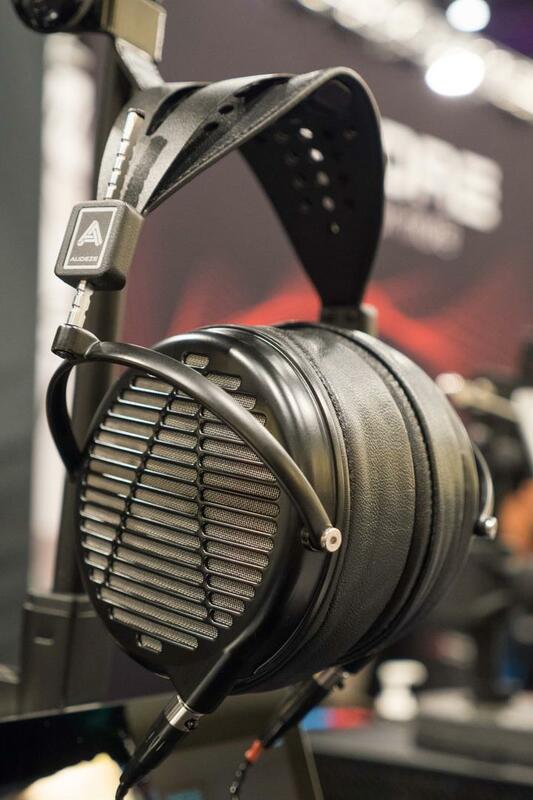 When I tried them on at the Audeze booth in CANJAM I was immediately struck by how comfortable they were in addition to their lush, romantic sound. They are also easy to drive with 101dB/1mW sensitivity and only 20 ohms impedance. 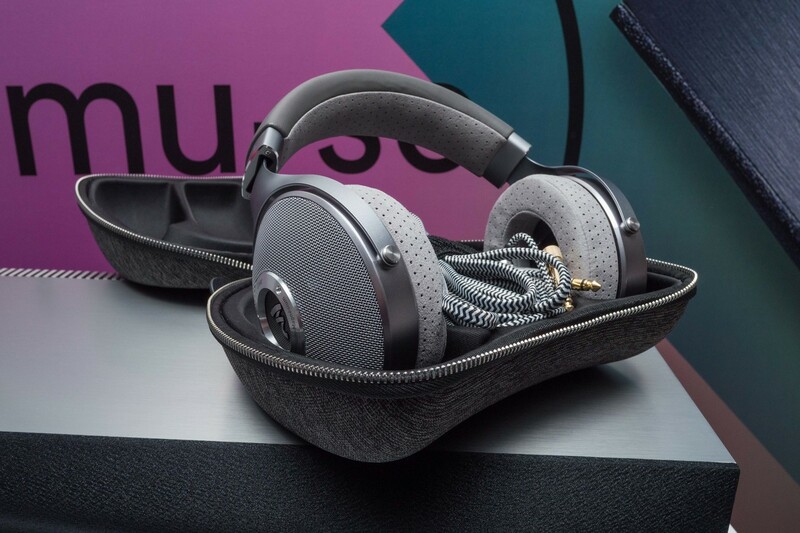 The new LCD-2 uses the same headphone cable connections as the originals so all those premium cables you may have collected over the years can be used with the latest version. Remember the original AKG-K1000 earphones? They were a unique design that still garners raves from avid users. The designers of the originals have formed their own firm for the expressed purpose of updating and refining their original design. The result is the Mysphere 3.1 headphones (3500 to 4500 Euros). Weighing a mere 330 grams with a sensitivity of 96dB/1mW and a low impedance of only 15 ohms, the Mysphere 3.1 should be easy to drive, even with some smartphones. Its fully open design features a 40mm-by-40mm dynamic driver using neodymium N52 magnets with a density of 1.5T. Production of the final versions has not begun yet, but interested audiophiles can add their names to the waiting list here. 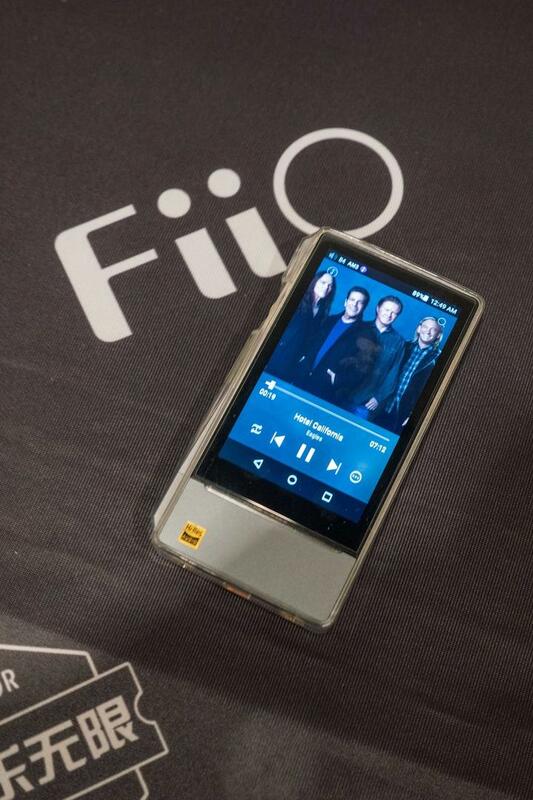 Fiio are sort of the mouse that roared in the portable world. Their low prices, high value, and impressive sales figures put other manufacturers on notice that value still matters in audio. The maker's latest flagship player, the X7 Mark II ($649 MSRP) is a case in point. It has native DSD support, PCM up to 192/24, both 2.4 and 5G Wi-Fi, 64 GB of internal storage, as well as two SD card slots, balanced and single-ended outputs, and eight hours of battery life. The X7 Mark II employs the ES9028PRO DAC chip set. Its headphone amp can produce 150mW into 32 ohms from its single-ended output while the balanced output can deliver 400mW into 32 ohms. The X7 Mark II also has multiple amplifier options due to its interchangeable amp modules. Klipsch, who at one time looked to be devolving into merely a lifestyle audio brand has been earning back its reputation with the new releases from its “Classic” series. The Heritage HP-3 ($1199) are hand-assembled and all their parts are easily replaceable. The sonics of the HP-3 are “based on legendary Klipsch sound principles of high efficiency, low distortion, and full-range sound.” The HP-3 accomplishes this by using a 52mm-diameter biodynamic driver coupled with a semi-open design. Not only does the HP-3 come with two detachable cables but also a solid-steel rod headphone stand. When I tried on the HP-3 headphones, their angled sheepskin earpads fit comfortably—even with my glasses on. While RMAF was full of new products, few pushed the limits of the sonic horizon as completely as the new device from Schiit Audio called the Gadget. It’s not a DAC, preamplifier, or headphone amp, it is a device that can lower the pitch of any piece of digital music without altering the tempo. And why, outside of a recording studio, would anyone want to do this? Let’s look at musical history. Currently C4 is exactly 261.63Hz, but it wasn’t always at that pitch. In baroque times A, which is now at 440Hz, was only 415Hz, which is almost a complete half-step lower than current tuning. Mike Moffat, Schiit’s digital designer, was doing some research when he came across the patent papers from Lloyd Loar, who was Gibson’s acoustical engineer in the 1920s. Loar was responsible for creating the modern, F-5-style mandolin. Mike noticed that one of the primary specifications for the F-5 mandolin was that the top was hand-carved and then “tap-tuned” to a frequency of C=256Hz, and that got Mike thinking about and then trying out the pitch-altering plug-ins available on the commercial market. In Mike’s words, “They all sounded like a**.” Schiit then hired a full-time employee with a PhD in mathematics to work on what was dubbed “the Manhattan Project.” It took over a year before the first version, which in Mike’s words, “Did NOT sound like a**,” was created. The current version went through several more revisions before production. Official release date and price are still to be determined. 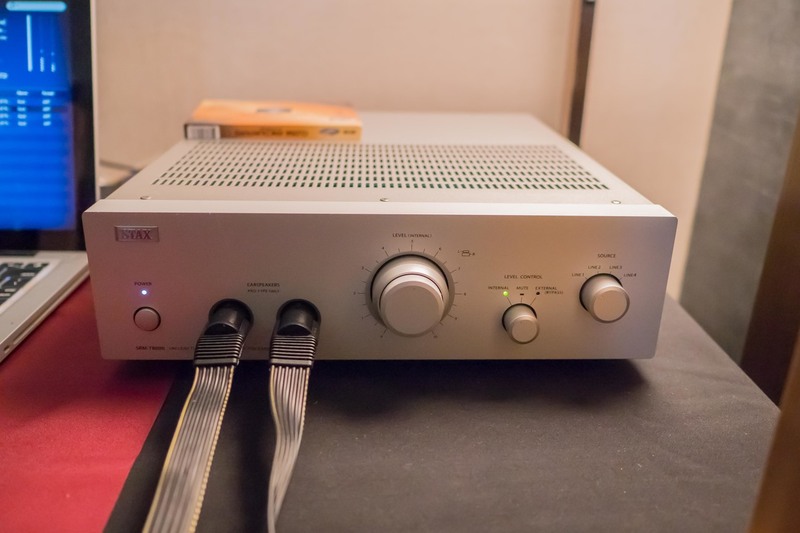 The Gadget consists of a small box, about the same size as the Schiit Magni3 headphone amp, that is inserted into the digital SPDIF signal chain between the source and the DAC. It has one knob, a toggle switch, and one LED light. The knob adjusts the pitch downward, the toggle is a bypass, and the LED lights up when you reach C=256Hz. The Gadget can lower the pitch even more than C=256 so that if you have an older recording that was pitched above C=261.63, you can still lower to C=256. Many live recordings of bluegrass bands done in the fifties and even into the sixties are pitched higher than A=440 because they tuned to each other and didn’t go by tuning forks, so by the end of a tour a band could be over a full step sharp! 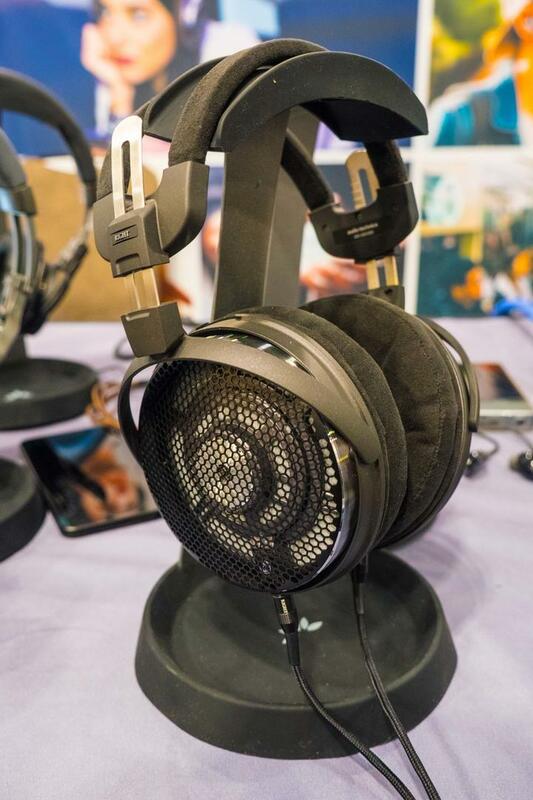 Best of Show: For the second show in a row, when it came to a complete headphone system I was floored by Mojo Audio’s “System A” in Room 551. It consisted of the Mojo Audio Déjà Vu music server/streamer (starting price $4555), Mojo Audio Mystique v3 DAC (starting price $5555), Exit Level Audio Annapurna 20B headphone amplifier (starting price $14,995) and HiFiMan HE1000 v2 ($2999). Best Sound (Cost No Object): Constellation’s system in the Conifer room was one of the few “large” systems that could scale up and down based on the program material—no five-foot-wide cellos. It contained the Continuum Audio Labs Obsidian turntable ($35,000) with Viper tonearm ($10,000) and Ortofon A-95 cartridge ($7000) with the Constellation Perseus phono preamp ($32,000) w/ DC filter ($6000), Constellation Virgo III preamp ($32,000) with DC Filter ($6000), Constellation Cygnus media player/DAC with Roon ($38,000), Constellation Centaur II mono amps ($80,000/pr. ), Wilson Audio Alexia Series 2 speakers ($58,000), and cables and power conditioning was the XL Level from Transparent Audio including all power cords, interconnects, and speaker cabling. Total retail price for cables and conditioning: $51,251; the components were mounted on an Artesania Exoteryc 4 shelf rack ($7600), with Artesania Krion turntable platform ($3600), and two Aire amp stands ($4000 each). 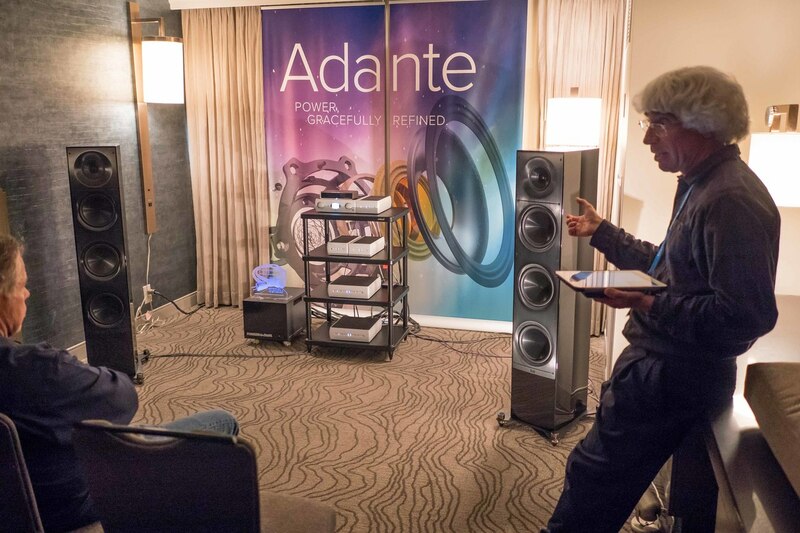 Best Sound (For the Money): This year, Elac’s set-up in Room 9025 with a total cost of $14,864 (without Marutani power device) was my choice for this category. It consisted of the new Elac Adante AF-61 speakers ($4998), Elac Alchemy DDP-1 DAC/preamp ($1995) plus PS-5 power supply ($495), Elac Alchemy DMP-1 media player ($1795) plus PS-5 power supply ($495), Elac Alchemy DPA-1 mono amplifier pair ($1995 each), Elac Discover media player ($1099), 512 Engineering/Marutani Consulting power conditioner ($22,000), power cables, interconnects, and speaker cables (PNA), Solidsteel rack ($495), and Stillpoints and Vicoustic acoustic treatments. Most Significant Trend: I saw more “next-gen” one-piece and integrated components where digital and streaming capabilities are joining the more traditional pre and power amp sections in one svelte box.